Because of their short life cycle and the large numbers of eggs laid, flies can quickly become pests in any area where suitable breeding sites are available. Feedlots and other sites of intensive animal husbandry are particularly susceptible to nuisance fly populations. House flies and stable flies generally breed within feedlots, in drains, sedimentation basins, silage pits, spilt feed and areas of undisturbed manure. 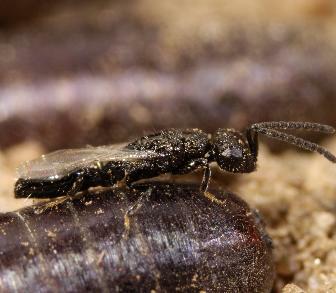 Spalangia are tiny wasps (2 to 3mm long) that are naturalised to Australia. They are parasites of certain fly species. Spalangia are harmless to other insects and to all vertebrate animals including humans. The adult female wasp lays her eggs into immature fly pupae. After hatching, the wasp larva feeds on the developing fly, ultimately killing it. About three weeks later, the adult wasp emerges from a small hole in the fly pupal case to mate and continue the cycle. Spalangia should be released regularly during spring and summer. The wasps may build up naturally without augmentative releases but it will take much longer for natural populations to reach levels at which effective control of fly populations can be achieved. In winter, the cooler, drier environment leads to a decline in numbers of both fly pests and parasitic wasps. It is best to release spalangia weekly or fortnightly, starting in spring or early summer before fly populations escalate to unmanageable levels. Extra releases should be made if fly populations are high. Spalangia are supplied as parasitised pupae in paper bags mixed with sawdust or vermiculite. Each cup holds 2,500 wasps. Transfer the pupae to parasite release units (available from Bugs for Bugs) and hang along fence lines or other suitable sites near to areas of manure. In horse stables and other indoor environments they can be sprinkled around the pens and areas where flies might breed. Spalangia parasites will emerge and seek out their hosts in the manure piles. They burrow down into the manure to deposit their eggs into the fly pupae. Large animals (cows & horses): 100-500 wasps per animal per fortnight. Small animal husbandry (eg poultry): minimum two wasps per animal per fortnight. Recommended release rates may vary according to the levels of existing fly populations, prevalence of manure or other suitable breeding sites. Levels of moisture, temperature, humidity and presence of other natural enemies of flies may also have an influence.